Jurassic World: Fallen Kingdom was one of my most anticipated movies of 2018, I love Jurassic Park and (maybe controversially) I really liked Jurassic World, so I was really excited to see where the sequel would go. Does it deliver on the promise of the Jurassic Park franchise? Firstly, I really enjoyed the movie from start to finish, but I have a sneaking suspicion I’d have enjoyed it a lot more if I hadn’t of seen any of the trailers. Seriously, Fallen Kingdom has one of the most spoiler filled marketing campaigns in recent memory. Nearly every single plot twist, action sequence payoff and the overall narrative structure of the movie has been revealed in the film’s advertising. Even key shots from the film’s final minutes are in the movie’s trailers. So whilst I was watching and enjoying the movie, I was rarely surprised or in suspense, as most of the time I’d already seen the conclusion of a sequence in the trailer. As a result it makes it quite hard to judge the film on its own, it’s not the fault of the movie’s creator that the marketing gave away so much, but I was definitely thinking I know how this ends during most of the films action sequences, which is a shame. Now putting that to one side, and looking at the film on its own merits I thought it was great. This is unlike any Jurassic Park movie you’ve seen before, part disaster movie / part horror movie, the film is literally split in half and each part feels very different. The first half is bombastic and over the top, whilst the second is much more intimate and smaller in scale. You replace dinosaur stampedes and volcanic explosions with small dark corridors and tense survival scares. 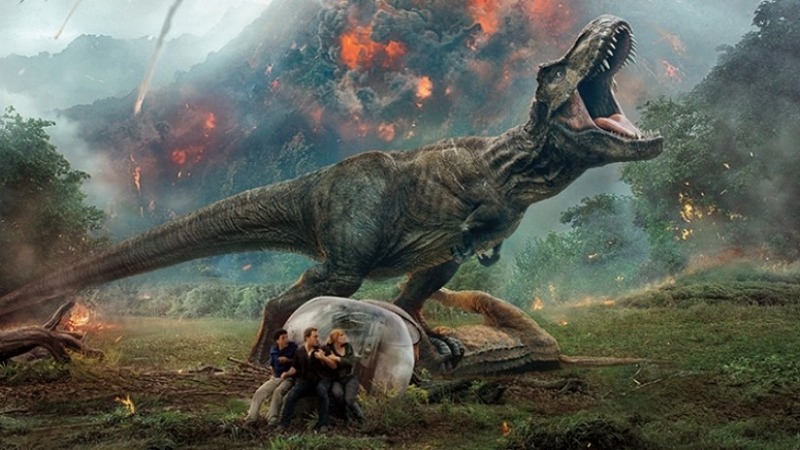 Despite this, the standard moments you’d expect in a Jurassic movie are all still here and it’s a great popcorn movie. The script is relatively straight-forward and as suspected isn't that different to Jurassic Park: The Lost World, but it's masterfully directed by J.A. Bayona and the action sequences are extremely well shot and structured. I’d definitely recommend Jurassic World Fallen Kingdom, and if somehow you’ve managed to avoid watching the movie trailers I imagine you’d enjoy it even more than I did.